Earnings may be growing but revenues need to follow, because sustainable earnings growth based on cost-cutting alone is not sustainable. As late as February 2010, well-read blogs like Pragmatic Capitalism were warning about this divergence between earnings and revenue growth. Although the idea is based on commonsense reasoning, now that revenue growth is not materializing on schedule, we’re hearing less and less about this thesis. I propose that overoptimistic expectations regarding revenue growth also help explain why the market needed to regurgitate the faulty logic used to justify the quick move from Dow 10,000 to Dow 11,000. 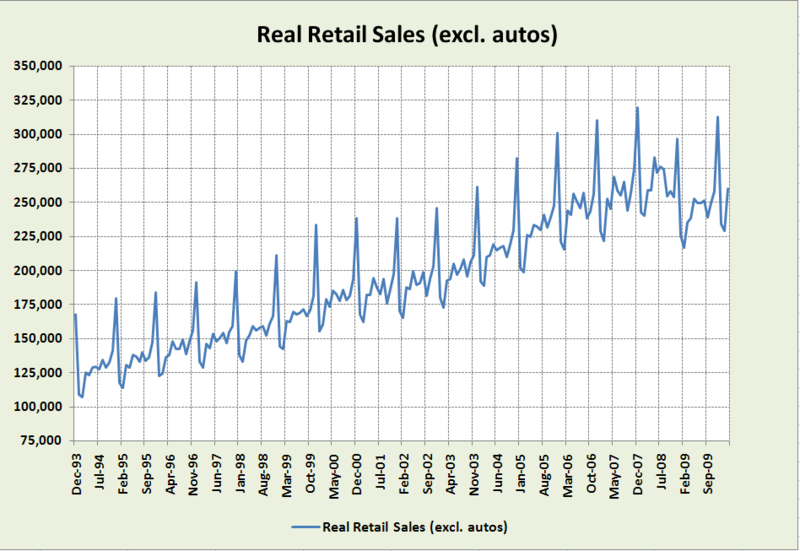 Notice how dramatically the events of Fall 2008 disrupt the time series of Real Retail Sales. Real Sales Ex-Auto in December 2009 was equal to its December 2006 value. Other severe recessions, such as post-September 2001, did not induce such a profound shock to the series. The next graph shows year-over-year growth (plotted monthly), and a 1-year moving average of growth. The 1-year moving average of year-over-year growth equals -2.5%, well below the trend average of 4.7% (5.4% measured from 1993-2007). 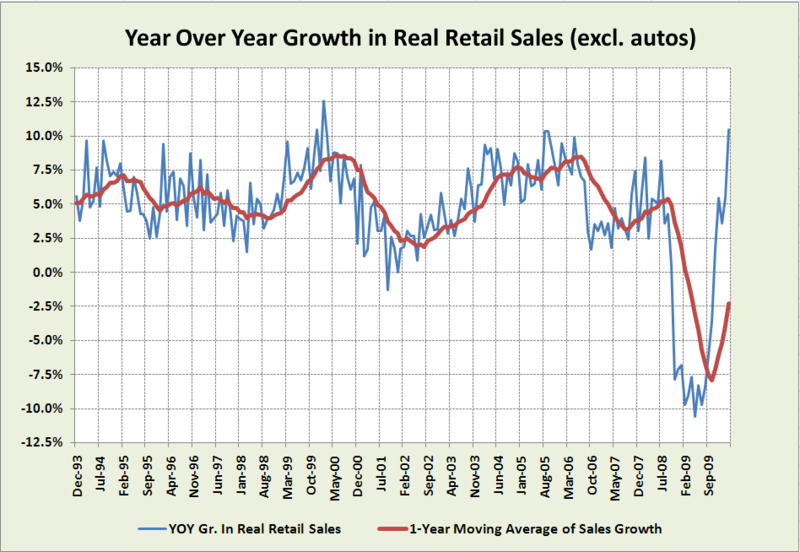 We would therefore need the unusually high sales growth we’ve experienced recently to continue for another 2 years to pull us back to trend — something that only happened during the credit-fueled spending binge of 2005-2006, and the stock bubble years 1998-1999. It seems unrealistic to count on sustained, above-average revenue growth to provide support for vigorous growth in corporate earnings in 2010-2011. It’s become increasingly apparent that, even at Dow 10,000, stock valuations reflect optimistic expectations vis-a-vis the fundamentals the economy will be able to generate. Herb Greenberg examined the sustainability of corporate free cash flow on CNBC (June 7), concluding that “companies have cut to the bone . . . and if business does not improve . . . don’t count on cash flow to continue on its hot streak.” Just as top-line revenue growth drives profits, it drives changes in free cash flow as well. Earlier on June 7, Benjamin Pace of Deutsche Bank cited “strong earnings growth” as the reason stocks should be trading closer to 16 times forward earnings, rather than their current multiple of 12-13. In fact, 16 times forward earnings is slightly above the historical average (stocks tend to trade for 15-16 times current, not forward, earnings). Pace’s thesis that stocks merit above-average multiples, given the current environment, is a tough sell. I have been reading your articles Sluggish Revenue Growth: Another Headwind For Stocks | Financial Market Commentary and they are pretty useful for me to learn something new and intresting. And You can also view our website also hyip monitors sites.